as a PDF file, which is a scan of a photocopy of the book , complete with manuscript annotations and some hand written notes, by an unknown author. For my authority for this Genealogy, I have consulted Dr. Styles’ history of Windsor. Connecticut ; the old Monuments in Turkey Hills which was a parish of Windsor; sundry family records; and I have examined some books on heraldry. Genealogies and family records tend to promote family ties and friendly associations. In my description of families, I speak generally of such sons and daughters only as lived to be nearly or quite men and women grown. 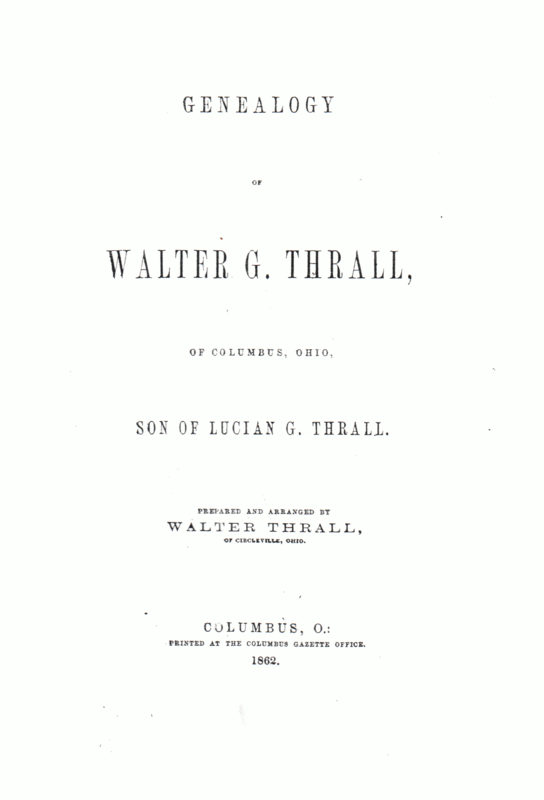 I have given but little description of any families except those in the direct line from William Thrall , the ancestor, who was born in England, to Walter G. Thrall, who was born in Columbus Ohio (who is the writer’s grandson.) I have given a sketch of the writer’s uncles, aunts and first cousins. I should gladly have given a more particular history of great uncles, and aunts, and second cousins, but I was too deficient in their history. For many years I have been collecting the facts here recorded. I hope this will excite others to extend the record through other lines of the Thrall family, which can conveniently be done by adding to this a few blank leaves; and I recommend to each person to extend the record as far as their information reaches. Few seem to be aware of the importance of keeping a correct genealogical trace of their families and ancestors. Many estates have been lost to their rightful owners for the want of the necessary evidence of relationship. Genealogies and family records tend to promote family ties and friendly associations. They cement he brotherhood of relatives. All are sensible of the pride and gratification one feels when he can turn to a line of virtuous ancestors. A person having a family pride, is less likely to be guilty of a disgraceful act, than one who is wholly indifferent as to his connections. The great body of the early settlers of New England were worthy men. Many were of the higher class. Puritanism did not generally prevail prevail among the ignorant or dissolute. There has been in our country a great neglect in preserving family records. There is now much difficulty in obtaining the names ages and locality, of many of our ancestors. It is not so in Europe, where the laws of primogeniture and hereditary honors prevail; they necessarily preserve family records. We should cherish with grateful recollection the memory of parents, and follow their good advice and example, forgetting their foibles and errors. Our ancestors came from England. We find the name there, and in this country, spelled in different ways—as Thrall, Trall, Thrale, Thrail. Of the name in England, we find Henry Thrall, or Thrale , of London, a wealthy brewer, who was a member of the House of Commons in Parliament in 1763 ; he died in 1781. His wife was an authoress, and published a volume of her works  in 1786. She was distinguished for beauty and accomplishments. Robert Trall was a Presbyterian minister, and an author. His son Robert was also a minister. James, the son of the latter, who spelled his name Thrall, was, in 1765, Bishop of Downs and Conner. William Thrall , 1st, our ancestor, generally spelled his name Thrall, yet I have seen a deed of his conveying land, where it was spelled Trall. Collins’ Peerage, Vol. 4, page 447, says Richard Thrall, Esq., of Denwick, County of Sussex, married Margaret, the eldest daughter of Mr. Onslow, who was Lord Chancellor in the eighth year of Queen Elizabeth. We find the name often in all the north and northwestern portions of the United States. We are informed that the church record of Windsor, Connecticut, states that a Congregational Church was formed in Plymouth, England, in March, 1680, and the same year came to Dorchester, Massachusetts, Their minister was the Rev. John Wareham, from Exeter, England. William Thrall , our ancestor, was a member of Mr. Wareham’s church. Mr. Wareham, and the larger part of his church, in 1635, settled in Windsor, Connecticut. I designate the generation to which the families belonged, by figures 1, 2, 3, &c., beginning with 1st: William , our first ancestor in this country, through his descendants; 2d, Timothy; 3d, John 1st; 4th, John 2d; 5th, Samuel; 6th, Jesse, 7th, Walter; 8th Lucian G.; 9th, Walter G-., including 247 years, from the birth of William to the birth of Walter G.
WILLIAM THRALL  was born in 1605; his wife's name was Goode. They had two sons, Timothy and David; perhaps others. William died August 3d, (Sabbath) 1678, aged 73 years. His wife died July 30, 1676. Windsor was required to furnish thirty men for the offensive war against the Pequods , the names of only fifteen of whom can now be found. a grant of land was given to each soldier and officer2; and to this day the memory of an ancestor who was in the Pequod fight, is an honorable heirloom in every Connecticut family. TIMOTHY, the son of William, was born July 26, 1641, and married Deborah Gun, Nov. 10, 1659. He died June —, 1697, aged 56 years. His wife died Jan. 7, 1694. They had nine children: Deborah, Timothy, Mehitable, Elizabeth; John, Martha, Thomas, Samuel and Abigail; the two last were twins. Timothy was a prominent citizen, possessing considerable property and influence. His name often appears in the records of Windsor. There were four generations of the name of Timothy. I do not attempt to give any history of eight of Timothy's children, or of their descendants I only speak of John and his descendants. JOHN 1st, the fifth child of Timothy, was born June 5, 1671, and married Mindwell Moses, Jan 6, 1697. They had nine children: John 2d, Moses, Aaron, Amy, Joseph, David, Joel, Charles and Jerusha. John 1st died April 18th, 1732, aged 61 years and 9 months. There were five by the name of John. of different generations. I have seen but little record of this numerous family, except of John 2d. JOHN 2d, the first child of John Thrall 1st was born Oct. 13, 1699, and married Mary Roberts. They had eight children: John 3d., Mary, Aaron, Lucy, Samuel, Mindwell, Ezekiel and Benjamin. John 2d died in 1762 aged 63 years. John 1st and John 2d, and a number of their descendants are still living there. Dr. Styles says Sergeant David Thrall and Sergeant William Thrall, and Issac and Giles Thrall were soldiers in the Revolutionary war from Windsor. 1. The Mystic massacre . 2. The 1638 Treaty of Hartford . SAMUEL , the fifth child of John 2d was born July 11, 1737, In Windsor, and married Lucy Winchell , daughter of Martin and Lucy Winchell. They had eleven children : Theodosia, Lucy, Mary, Samuel, Aaron, Jesse, Eliphas, Worthy, Chauncey, Mary and James. The first Mary and James died young. All the others had large families. Samuel 1st (the writer’s grandfather) was a farmer, active vigorous and industrious. He was an officer in the English service in the French war of 1762  and a Captain in the American service in the war of the Revolution. Before the Revolution he removed from Windsor to Granville, Massachusetts. He sympathized with the malcontent Shays , in 1784, and suffered considerably thereby. In 1788 he was a member of the Legislature of Massachusetts . In 1790 he removed to Rutland, Vermont. All his sons and daughters moved there about the same time, except Samuel, Jr., Lucy and Worthy. Samuel 1st had the reputation of a sensible honest man, and exercised considerable influence in society. He was about 5 feet 9 inches in height and weighed about 150 pounds, which was lighter than the average of his brothers or children. He was many years a consistent member of the Congregational Church  in West Rutland. He died December 3, 1821 aged 84 years and 5 months. He was the last survivor of his generation. Samuel’s wife, Lucy , was a woman of plain manners, stout frame and robust health; a kind-hearted Christian, always ready and willing to do her whole duty to her family and neighbors. Her father  died February 15, 1785. Her brothers  were Martin, Nathaniel and Dan. She had one sister, Deborah, who married Simeon Lewis , of Windsor, Connecticut. I am enabled to furnish a more full sketch of the sixth and seventh generations, than of those which preceded them, or of the descendants of the seventh. Theodosia , the first daughter of Samuel and Lucy inter-married with Titus Adams. They removed from Rutland to Esophus, Ulster County, New York, about the year 1810. Their sons  were Titus, Jr., Timothy, Benjamin and James, and one daughter, Amanda , who married — Rosecrans , of Ohio. Benjamin’s descendants, in 1860, lived near Springfield, Massachusetts. Lucy, daughter of Samuel 2d, married Eber Spelman; they lived and died in Stratford, Toland County, Connecticut. They had six sons: Daniel, Eber, Apollos, Sylvester, Samuel and Aaron, and three daughters : Statira, who married John Johnson; Charlotte, married Orren Howland; and Elsamana, married John Cade. All had families, and most of them who were living in 1851, resided in Stratford, Connecticut. Dr Sylvester Spelman resides in Granville, Ohio; he is a worthy member of the Baptist Church, is wealthy and respectable. Eber is a Presbyterian; the daughters are Methodists; Eber, the father, and Daniel, Charlotte, Samuel and Apollos, were dead in 1855. Lucy, the mother, died August 21, 1824, aged 67 years. Samuel, Jr., the son of Samuel and Lucy, was born August 31, 1760, and died May 8, 1815. He married Triphosa Cooley, sister of the Rev. Dr. Cooley, for more than half a century the pastor of the Congregational Church in Granville, Massachusetts. Samuel was one of the Licking Land Company, who, with others, removed from Granville Massachusetts, in the year 1805, and formed the first settlement in Granville, Ohio, where the Company had purchased a township and three-quarters of land. He was a farmer, a member of the Congregational Church, an honest, industrious and respectable citizen. He had been a soldier in the war of the Revolution; his widow died in 1841, aged 74 years. They had seven sons : James, Aurelius, Samuel, Cotton M., Alexander, William and Timothy L; and five daughters: Sarah, who married Jacob Goodrich; Mary Ann, who married P. Dean; Abigail, who married George Plumb, and after his death Ira Wood; Lucy, who married Azel Mead, and Barbary, who died aged eleven years. All except the last named had families. James was killed about the year 1814, by the fall of a log or tree while he was chopping it. Aurelius was killed about the year 1831, by the falling of a bank of earth on him, while he was working near it. Samuel was killed about the year 1832, by the kick of a horse; and Cotton M. was killed about the year 1848, by a fall from a wagon. Strange fatality! that the four brothers should, by accident, at different times and ways, meet a sudden death. Aaron Thrall, the fifth child of Samuel and Lucy, was born January 25, 1763, and died June 7, 1810. He was for many years a Justice of the Peace, active in business, a man of property and an influential citizen. He married Olive Loveland. They had one daughter, Rosetta M., (who married William Paige,) and five sons: Anson R., who died about 1851; Linus G., Aaron W.; (who died in 1820;) Homer L., and Orlando M. Aaron’s widow, married Captain William Mead, and died in 1858, aged 89 years. She was the last survivor of that generation of the Thrall family. In the year 1815, the families of Aaron Thrall and William Mead emigrated from Rutland, Vermont, to Granville, Ohio. All the children, except Aaron, Jr., raised families. Homer was a distinguished physician, and for a number of years a Professor in Kenyon College . All the children of Aaron were living in January, 1862, except Aaron, Jr. and Anson R.
JESSE. the sixth child of Samuel, was born May 7, 1765, and died at, Circleville, Ohio, December 16, 1843, in the 79th. year of his age. He married Mabel Rose, daughter of Justus and Deborah Rose, January 13, 1791, in Granville, Massachusetts, and soon after settled in Rutland, Vermont. In 1819 he removed to Ohio. He had a strong intellect, a retentive memory, and was a jovial companion; was fond of company, a farmer; he was a man of large size. Mabel his wife, was born in Granville, Massachusetts, January 13, 1768, and died at Granville, Ohio, December 17, 1834, being nearly 67 years old. For about fifty years she was a consistent member of the Baptist Church, beloved by all of her acquaintances, pious and exemplary; a warm friend, and possessed a cultivated mind. This couple had eight children: Luther, Walter, Reuben R., William B., and Charlotte, and three others who died in infancy. The surviving children of their parents were all communicants in the Episcopal Church . I shall say more of them hereafter. Eliphas, the seventh child and fourth son of Samuel and Lucy, was born June 23, 1767, and died March 15, 1834. He married Polly Mead, who died in 1841, aged 67 years. He was a Justice of the Peace, an upright and industrious citizen, for a number of years a member of the Congregational, and afterwards of the Methodist Church. He had seven sons: Joel, Oliver, Lyman, Eliphas, Benjamin F., Aaron and Worthy; and three daughters: Orrilla, who married Johnson Brown, of Underhill, Vermont; Mary, who married Rev. Thomas Parker, of Licking County, Ohio, and Caroline, who married Samuel Cooper. All had families. The family, except Orrilla, in 1815, moved from Underhill, Vermont, to Granville, Ohio. In 1860, all were dead except Dr. Benjamin F., and Mrs. Parker who who in 1860, resided in Licking County, Ohio. Oliver Lyman, Aaron, Worthy and Caroline, died near Mt. Carmel, Illinois Oliver left five children, Lyman four. Dr. Aaron five, Worthy four, Caroline four, Joel two, Dr Benjamin F., Mrs Parker and Eliphas, each raised nine children; Orrilla left four. Worthy, the eighth child, and fifth son of Samuel was born May 27, 1769 and died July 16, 1816. He married Sarah Phelps, and lived in Windsor, Connecticut. Their children were: Sally, who married Arthur Griswold, and in 1859 was a widow, living in Windsor; Friend, Harvey, Deborah, Lucy, Lewis, Leicester and Minerva. Friend and his wife and child, were lost in Lake Erie about the year 1830, while emigrating to the West. Report says that four of Worthy’s family were in 1850, living near Tonawanda Creek  in Western New York. Chauncey, the sixth son of Samuel and Lucy, was born December 6, 1772. He married Polly Chipman, and had three sons: Jonathan C., Chauncey, and Samuel R.; and three daughters: Lurena, who married Henry Hewett and both died some years ago; Theodosia, married Judson Gorham, and Mary married Jacob Bailey. Chauncey, Jr., Theodosia, and Mary, and their families, lived in West Rutland, Vermont, in 1860. Jonathan C. died in 1852; his family are in Rutland. He was a communicant in the Episcopal Church, and a man of extensive information and influence Samuel R. is a Presbyterian clergyman in Illinois. He had been a Representative in the Legislature, and most of his life in. some public employment. His wife died a few years before him. Polly, the youngest daughter of Samuel and Lucy, died near Lockport, New York, July 26, 1840, aged 64 years. She married Solomon Mead, who died about 1821. They had seven children: Helon, Huldah, Mary, Lucy, Hiram, and others. Mr. Mead and family lived in Cornwall, (Vt) until about the year 1817, and after that, in Royalton, near Lockport, New York. Polly’s second marriage was to Paul Sawyer. In 1858 he was elected and commissioned a Judge of the Probate Court of Pickaway County, O. He became a member of the Episcopal Church in 1817. He was a member of the Convention in 1818, which elected Bishop Chase  the first Bishop of the Diocese of Ohio; and also a member of the Convention in 1831. which elected Bishop Mcllvaine, as he was of that in 1859, which elected Bishop Befell. William B., the fourth son of Jesse and Mabel, was born in Rutland, Vt., June 18, 1798. He learned the art of printing in Rutland, and settled in Ohio in 1817; located in Circleville  in 1819; married Nancy Graham, August 6, 1822. She died July 26, 1823. He married Maria Rockwell, February 1, 1825. They had nine children, five of whom died young. William R. is a physician. He was a surgeon in the Russian army in the Crimean war  of 1854, '55, and '56; and a surgeon in the Union army  in 1862. He married Hannah Galligher, of Zanesville, July 14, 1859. He is a Free Mason. Henry, at the age of 22, commanded a company of 100 volunteers from Columbus, called by the President for the defence of Washington City; was in the battle of Bull Run  and shortly after received from the President a commission as Assistant Adjutant General. He is now (1862) on the staff of Maj. Gen. Fremont . George E., the fourth son of Walter and Harriet, was born in Circleville, Ohio, April 23, 1829. He graduated at Kenyon College, Gambier, Ohio, in 1848, and finished a theological course of study at the seminary  near Alexandria, Virginia. In 1862 he was rector of the Church of the Messiah, at, Brooklyn, New York. He married Thomasina Gists; they had one daughter, Minnie. His second marriage was with Charlotte Bostwick, November 16, 1859. The descendants of Lucian G. and Martha: WALTER G. , in whom this line of genealogy now ends (June 1862,) was born in Columbus, Ohio, November 20, 1852. I have thus briefly traced this genealogy in a direct line through nine generations, embracing 247 years. In the year 1816, he had about one hundred and twenty first cousins, with the most of, whom he was acquainted. Those on his father’s side were of the seventh generation from William , the first ancestor in America; those on his mother’s side were of the fourth generation from Jonathan and Abigail Rose. Jonathan was born (says tradition,) in Scotland . He and his family settled in East Granville, Massachusetts, in 1741. He was a deacon in the Congregational Church. He was burned to death when his house was burned, in Granville , in October, 1767. His wife, Abigail, died in 1793, aged 103 years. She had been blind for about fifteen years. Her memory was remarkably good until near her death. They had fourteen children, seven of whom lived to a very old age, and all of whom had families. In 1790, when she was one hundred years old, a meeting was called of many of her descendants, a sermon was preached on the occasion, and her off-spring enumerated. She then had one hundred and ten grand children, over three hundred great grand children, and over forty of the fifth generation. While she was yet living, she had over four hundred and fifty living descendants. On the place where her husband was burned, a house was erected in which she lived, and in 1859 two of her grand children, then very old, were living in it. Their sons were Jonathan 2d, David, Daniel, John, Justus, Elisha and Sharon. Their daughters were Abigail, who married Sharon Peas, and settled in Enfield. Dorothy married —— Seward, and settled in Granville. Damara married Oliver Treat, and settled in Weathersfield . Betsey married Aaron Spelman, and settled in Granville. Caroline married John Seward. I do not attempt to give the history of any of Jonathan’s descendants, but Justus, who is the lineal ancestor of Walter. I hope others will extend the history.